No amount of badgering from teachers or parents can motivate a student in the same way that self-motivation can. This is a fantastic, dynamic and highly inspirational workshop that leaves students excited about their future and willing to put in the effort they need to succeed! Motivation energises us and gives us the will and determination we need to succeed. In the short term it is possible to motivate someone by offering incentives or, indeed, penalties but this is not sustainable. True motivation comes from within. No amount of persuasion or pushing from lecturers, teachers or parents can motivate a student in the same way that self-motivation can. Positively MAD’s ‘Mastering Student Motivation’ is designed to inspire students to identify their own ‘Whys’: why they want and deserve to succeed, why they are prepared to step-up to the challenges of education beyond school, why they should go the extra mile to achieve their potential and even why they should bother to get out of bed in the morning!!! This is a challenging, dynamic and highly inspirational workshop that leaves students excited about their future and willing to put in the effort they need to succeed! Mastering Student Motivation is a high impact experience designed to motivate students to take responsibility for their own futures. It helps students achieve clarity in their ambitions and inspires the levels of determination required to succeed in further education, higher education and beyond; critically, because they want to – not just because others tell them they have to! With their objectives clear it then provides a simple but effective goal setting template for them to use over and over again as they become accomplished goal setters and achievers. MSM is run on your site to groups of up to 150 at a time. It is a 2½ hour seminar and will empower your students with self-motivation and healthy, target-centered thinking patterns. Students question their limiting belief systems & adopt a healthier, positive state of mind. Students challenge habitual thinking patterns and replace them with more positive behaviours. Students develop self-motivation skills, become focused on achieving self-set goals and become more confident in their ability to succeed. Using the powerful personal development model State - Behaviour - Results, this seminar is especially useful for: students who require clarity about what they want to achieve in life; students who need to step-up to the demands of the next level of education and students who lack the discipline to set and pursue goals. It offers them the opportunity to clearly identify their own ambitions and puts their education into a context that is meaningful to them. Critically, it provides them with a reusable template to plan short, medium and long term goals, setting their sights clearly on their desired outcomes and providing a fantastic way of monitoring and celebrating their progress as they continue through each phase of their education. To encourage students to take personal responsibility for their futures. To remove self-limiting beliefs and glass ceilings. To encourage students to develop self-motivation. Students learn to challenge habitual behaviours and thought patterns replacing them with more positive ones. They gain clarity on their ambitions and how to take the necessary steps to achieve these. They become conscious of the impact their own state of mind has on their ability to succeed and will be motivated to make any fundamental attitudinal shifts needed to achieve the lasting changes that lead to success. Fantastic day, Jay was amazing pupils were buzzing with ideas. Rachel’s delivery was excellent, and engaged the students. The materials were a good combination of teaching and practical activities and the content was interesting. Student evaluation of the event was very positive. Thank you Rachel. Really good ideas. Great that we were given explanations why the ideas could work for us. Many from Years 10 and 11 felt that they would definitely use the study ideas. The presenter/workshop leader was effective because she was enthusiastic and funny (students’ comments). A really good day Shenaz was bubbly, enthusiastic and had a good rapport with the students. She was able to keep the more difficult students engaged and involved which was very positive. Your sessions were very well received by students and the Ofsted team were also very impressed. An excellent day, which enthused the students and covered a range of topics. The timing of the day was perfect for us, as it kick started the New Year and countdown to the GCSE exams. Jay was engaging and related well to the students. The course content is highly appropriate and we will want to repeat these sessions next year. The presenter was very well received by the students and I have had a number of very positive comments back from student, staff and parents. Well organised and year group appropriate. Engaging presentation. Presenter was clearly knowledgeable and passionate about her subject matter. Well balanced between factual delivery and stimulating activities. It was a great day for our Key Stage 4 students and for staff. We have had lots of positive feedback from students who picked up a ‘can do’ attitude from the session. The staff welcomed the chance to see what students have been learning and many have already been embedding the proposed revision strategies in their own teaching. Brilliant, enthusiastic presenter. They did really enjoy the day and there new slogan in the school is GO MAD. On behalf of Marlwood school we would like to say ‘Thank you’ for a brilliant day! Positive feedback from staff and Year 11s. It was really good, all of the pupils were engaged for much of the time, which is no mean feat on a warm day with a gym full of 15 - 16 year olds. Well planned, informed and a good blend between exam skills, revision strategies, resilience and motivation. Fantastic interaction with students, creating a positive learning environment. Shenaz,Thank you so much for the fantastic day that you ran on Thursday, we were really pleased and I know that the students enjoyed themselves and would have got lots from your energetic style and brilliant strategies. We will be looking at further intervention following the mock exams. It was great to meet Emily today. She had such great energy and positive mind set. She was able to really get the first group working and thinking. The second group were a bit more of a challenge but she worked very hard and there was a good energy in the room when I came in at the end of the second session. The students and teachers really enjoyed the session and the students were thinking about themselves in a different way during their destinations interviews which followed Emily’s session. It was a great day and we would definitely have something similar in school. Thanks. Excellent day, Lots of energy from the presenter. An outstanding workshop that engaged and motivated our pupils. Shenaz really engaged with all our pupils and they were all very motivated following the session. An excellent day and excellent presenter. We were very impressed yesterday. The course content was exactly what I was looking for. The students were engaged, motivated and came out ‘buzzing’. The practical techniques and target setting skills have given the students a good base knowledge. The ‘buzzing’ students were a direct result of the quality of delivery by Natalie and Karim so please pat them on the back. We loved the day. We thought that Jay was very engaging and both students and staff enjoyed the sessions he delivered. We were able to take strategies from the training to support our students and staff have talked passionately about the grid strategy for revision and the mind mapping. As a pastoral team we are going to use the reflective ‘what have I done well this week’ with all of the students. Natalie was excellent – her enthusiasm and passion were really clear, and this rubbed off on the students. They were all really positive about the content and the course leader. Communication with Natalie before the event was really easy, she arrived early in the morning and was adaptable to our requests! 10/10!!! The feedback for the day has been overwhelmingly positive – from parents, staff and pupils. Following the course, Year 11 pupils have already drafted a first timetable this morning so are on track to continue with the enthusiasm and ideas shared by Shenaz during the day. 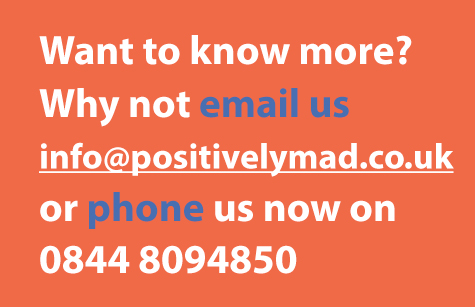 We have seen that the ‘Positively MAD’ days have a noticeable effect on pupils. It plays an important part in our school calendar and provision for pupils and helps to inspire and motivate students as well as give them some practical tools that can be used in class and at home immediately. Unfortunately I didn’t get to attend the course but feedback from colleagues was all very positive – they thought Shenaz was brilliant and she had as much impact on them as she did on the kids. They thought her behavior management was outstanding! Excellent from start to finish – not just Shenaz (who impressed everyone) but the whole origination was efficient and like clockwork. I’ve been really impressed. The workshops were interesting and interactive. Jay was very lively and relatable. The 2 different sessions were very useful to each year group and hopefully all students came away with some motivation for the coming year. Jay’s session on mind mapping was an excellent way to show student how they can revise effectively and proof that it works. The day ran very smoothing and Jay was very flexible with your timings and managed to deliver the sessions equally as well in a shorter time frame. Rachel was brilliant, really lively and engaging throughout the day. The students learning a lot of new techniques to help them revise in the up-coming months. I think they were surprised about how much they could recall. We had a great day and I am now looking at ways to ensure that these techniques are used by students and endorsed by staff. Mastering Motivation with Y12 students was well received. Pace, delivery and content all good and appropriate. Excellent. All aspects of the course were beneficial and the feedback from all participants was excellent. Shenaz was amazing at motivating and engaging the students. A very worthwhile experience for the students and for the teachers who attended the sessions. Students found Jay’s delivery both entertaining and engaging. The key messages supported what we say in school, but were delivered by someone different in a different way. Lots of images / words / anecdotes to hold attention; the pace was good. Staff in attendance felt the students’ focus and engagement were very positive. Jay clearly knows how to relate to a hall full of teenagers. Well-structured. Jay was flexible to work around our time slots / breaks etc and understood and was not phased by the workings of a school e.g. use of hall as social space at lunchtime. The staff session was useful in that staff are now equipped to do follow-up work in terms of targets / deadlines. Steve was able to quickly build good rapport with the students and kept their attention throughout the morning. The sessions were informative and practical. It was learning and fun put together! A lot of content was covered in a fairly short amount of time. The day went smoothly and Steve was very well prepared. Jay was excellent in every way. Our students responded very well to his workshop, and we have received lots of positive comments from our students following the event. The content was appropriate and it met the specifications outlined in our brief. Jay’s communication was excellent in the run-up to the day also. I will certainly consider booking this event again for next academic year. Our thoughts will turn to organising next year’s Year 12 Induction Event in early 2019, and I look forward to consulting Positively Mad in due course. I would like to offer my thanks, and on behalf of everyone at Bradford Grammar School for a superb training workshop. They were great, Shenaz had the expertise and skills needed to keep the year 11’s engaged, learning and achieving what was set out in the workshop. Good pace and inspiring/ motivational elements added too. The techniques used were simple enough and explained well to enable to students to use them in practice. Excellent- the course really delivered what we were looking for. Resources were very good as was the presenter. The students were very engaged and enjoyed the whole course. Many commented that they had gotten a lot from the material they looked at and were hoping that it will help them with their exams. Very relevant to our pupils and really opened up the thinking for many of them. The students themselves commented on how positive they found the sessions. Fantastic engagement and the fun and active approach really engaged many of the pupils. Very engaging and easy for the students to relate to. Fun and dynamic the students should have got a lot out of it Shenaz was very motivational and gave the students really valuable tools to take away and use in their studies. The course content was great. I was really impressed at how the students were able to use the information given to them at the beginning and then recall it all several hours later. The skills taught will prove very beneficial to our students and also to staff in school, skills we can build on in the weeks to come. There was a lot of information delivered over the course of the day but not too much for the students to take it all in. Jay, our presenter, was excellent. He quickly got the measure of our students and identified and built relationships with the few who may have become disengaged with the seminar. He was lively and entertaining – all the students are talking about him today. A great session overall, thanks very much! "Natalie was excellent – her enthusiasm and passion were really clear, and this rubbed off on the students. They were all really positive about the content and the course leader. Communication with Natalie before the event was really easy, she arrived early in the morning and was adaptable to our requests! 10/10!!!"